› Author Affiliations Funding This work was supported by a grant from the Deutsche Forschungsgemeinschaft (SFB/TRR34 project C10 to S.H. and A.G., project C4 to B.M.B.). The work was also partially supported by the BMBF/“Unternehmen Region” as part of the ZIK-FunGene. Staphylococcus aureus can cause bloodstream infections associated with infective endocarditis (IE) and disseminated intravascular coagulopathy (DIC). Both complications involve platelets. In view of an increasing number of antibiotic-resistant strains, new approaches to control systemic S. aureus infection are gaining importance. Using a repertoire of 52 recombinant S. aureus proteins in flow cytometry-based platelet activation and aggregation assays, we identified, in addition to the extracellular adherence protein Eap, three secreted staphylococcal proteins as novel platelet activating proteins. Eap and the chemotaxis inhibitory protein of S. aureus (CHIPS), the formyl peptide receptor-like 1 inhibitory protein (FLIPr) and the major autolysin Atl induced P-selectin expression in washed platelets and platelet-rich plasma. 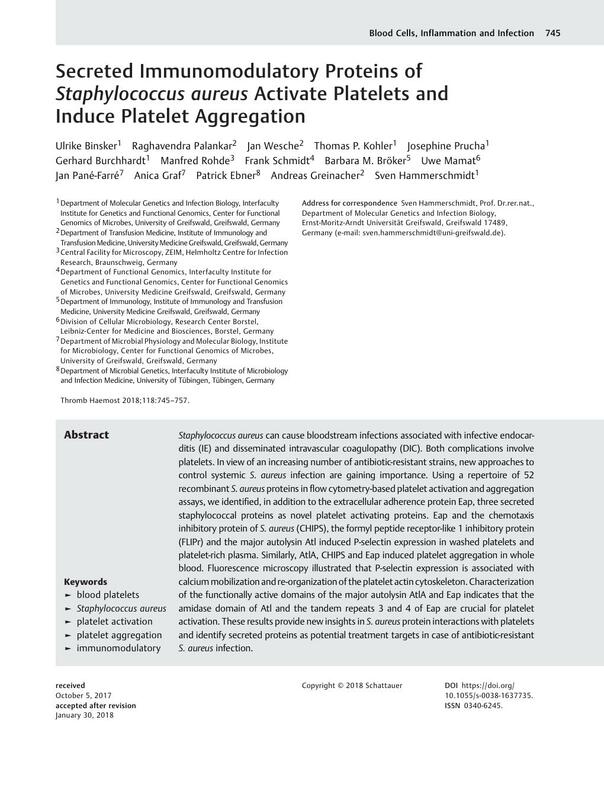 Similarly, AtlA, CHIPS and Eap induced platelet aggregation in whole blood. Fluorescence microscopy illustrated that P-selectin expression is associated with calcium mobilization and re-organization of the platelet actin cytoskeleton. Characterization of the functionally active domains of the major autolysin AtlA and Eap indicates that the amidase domain of Atl and the tandem repeats 3 and 4 of Eap are crucial for platelet activation. These results provide new insights in S. aureus protein interactions with platelets and identify secreted proteins as potential treatment targets in case of antibiotic-resistant S. aureus infection.